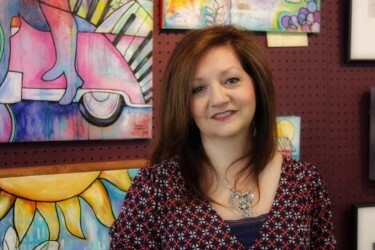 Melanie Douthit, artist from West Monroe, Louisiana, started painting as a teenager and fell in love with the process. Melanie works in acrylic and watercolor as well as creating mixed media collage pieces. Her work reflects things she loves: flowers, animals, nature and New Orleans. She also works with mixed media. 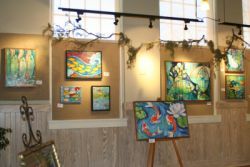 Melanie's work has been displayed locally and in regional shows and art competitions which include the Downtown Monroe Gallery Crawls (six times a year), Baton Rouge Gallery, Rougarou Gallery and the Great Artist’s Collective in New Orleans, Natchitoches Art Guild, Franklin Parish Catfish Festival, Old Post Office Museum, Winnsboro, LA, El Dorado Art Center, Ruston Peach Festival, Arkansas's Oil and Brine Museum, Shreveport's Barnwell Garden and Art Center, the Tunica Riverpark in Mississippi, and Mitchell Museum in Tyler, Texas. She is a member of the Ouachita River Art Gallery, and former member of the Hoover Watercolor Society and Mississippi Watercolor Society. Her "Mardi Gras Dachshund" painting has been collected by Mimi's Cafe Restaurant in over 30 locations nationwide, and has been one of her most popular paintings. Her works are included in private collections across the United States and in Canada, Puerto Rico, United Kingdom, France and Greece. Melanie's complete resume can be viewed here.